After 11 years as collaborative pianist with Amabile Youth Singers and Prima: Amabile Women’s Choir, Allison Eagles is stepping back to concentrate her energies as a Mom, and to spend more time on her other musical pursuits. She joined the Amabile family as accompanist in 2004. That list of musical pursuits is long, too. Allison holds a Bachelor of Music in Voice Performance from Mount Allison University and a Masters degree in Collaborative Piano from the Don Wright faculty of Music at University of Western Ontario. In addition to coaching and performing at UWO, Allison teaches voice, piano and theory to students of all ages at her private studio. She is also an accompanist, chamber musician and adjudicator in high demand in the London musical community and throughout Ontario. Allison is also a valued chorister with the Canadian Chamber Choir. Best wishes to Allison, Jason, Adrienne, Kira and Vivian – Amabile will miss you… a lot! After a frenetic ride, Bonnie IS retiring! The announcement made earlier this week by Artistic Director Dr. Carol Beynon to a stunned Primus: The Amabile Men’s Choir. Bonnie contemplated retirement a year ago, but was convinced to stay on to celebrate the Amabile Boys’ and Men’s 25th anniversary – much of that with Bonnie alongside them. During the past 23 years, Bonnie Shewan Burroughs has become an integral and much loved accompanist: performing, touring and recording with the Amabile Boys Choirs at a wild pace, as their visibility on the world stage has exploded. 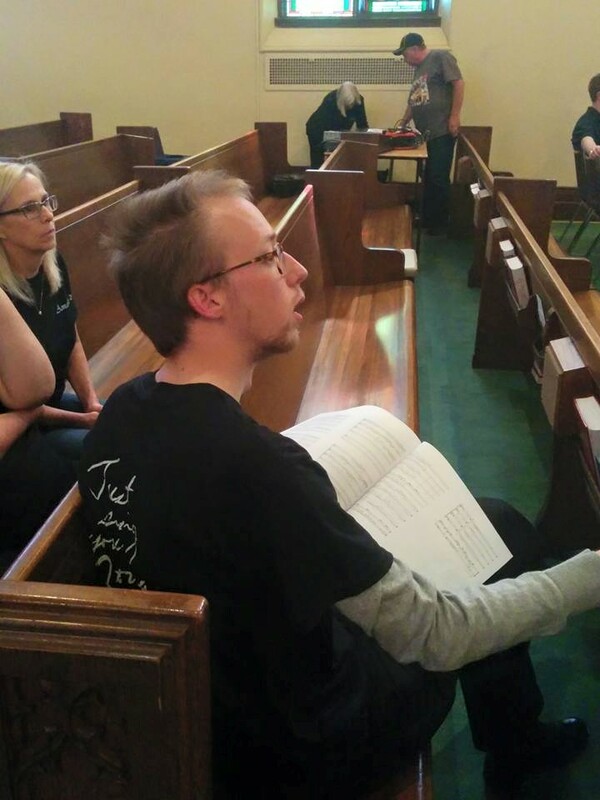 This past season, Bonnie has been playing for the Young Men’s Ensemble and Primus: Amabile Men’s Choir. After graduating in Piano Performance from UWO, with Dr. Damjana Bratuz, she studied and attended mater classes in Salzburg, Vienna, Siena and London, England. She has performed chamber music with leading instrumentalists, including her daughter Sarah Jeffrey (Toronto Symphony Orchestra), and son Paul Jeffrey (Winnipeg Symphony Orchestra) – most recently for the Millennium Summer series in Winnipeg. Bonnie performed in the prestigious Aeolian Concert Series at Wolf performance hall with members of the Toronto Symphony Orchestra, in addition to performances with instrumentalists from the Chicago Symphony Orchestra, Israel Philharmonic, New York Philharmonic and Orchestra London. She has performed frequently as a chamber musician and accompanist with leading instrumentalists. She may be heard on programmes recorded by CBC, CJRT, and also on the CD. Bonnie has taught piano in Toronto at Branksome Hall and Havergal College, as well as private schools in England. With the Ardeleana Trio, she also premiered many newly commissioned works and recorded “Spinners of Starlight”, a CD of contemporary trios. While this marks a bittersweet milestone for us, we celebrate all that Bonnie has contributed to each and every one of us personally and to our choirs. We have all grown up together in this musical organization and her role as collaborative pianist has been an integral part of our growth and development. She is a consummate professional and an intuitive accompanist – knowing exactly what was needed when. While we are sad to see her go, we celebrate her accomplishments and the entire Amabile family wishes her well as she and husband Patrick slow their world down… just a bit! They knocked it out of the park in Toronto! Toronto Star Theatre Critic Richard Ouzounian liked what he heard in Toronto yesterday (Tues June 16/2015) at Roy Thompson Hall. 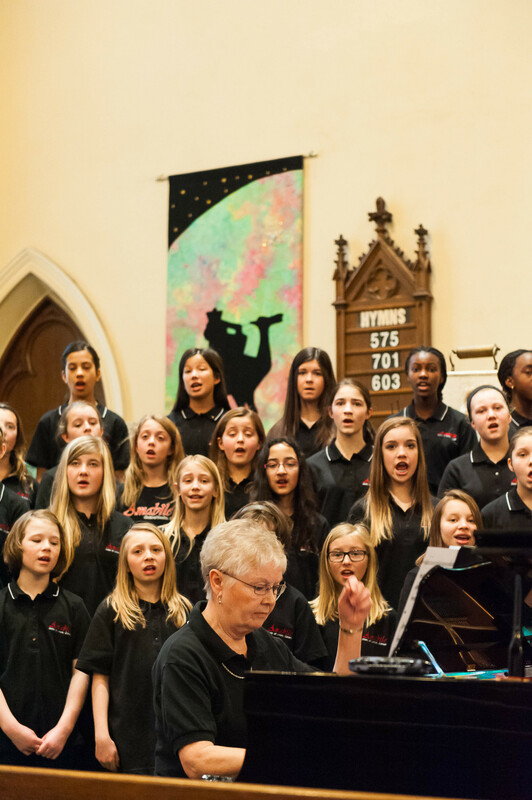 The two senior choirs in the Amabile Choirs family, took along some guests and headed down the 401, as the invited guests of the Toronto Symphony Orchestra, for three shows.